Synoquin EFA Capsules for Cats - 90 Pack is a natural joint supplement, that encourages the growth and maintenance of cartilage and healthy joint formation. 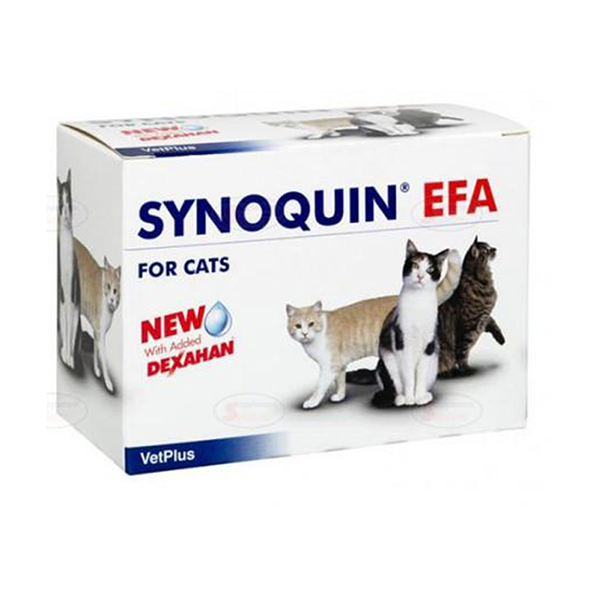 Providing the essential nutrients which cats may not receive from their daily diet, Synoquin EFA Capsules offer cats suffering from arthritis an effective alternative to more traditional drugs. These capsules are more efficient than regular fish oils as it is more easily absorbed due to being specially formulated with the added ingredient Dexahan (a highly purified form of krill). The key ingredients are Chondroitin and Glucosamine, which provide support to the repair and maintenance of joints, allowing your pet to keep active and improve overall health.